Are your hands itching to starting crocheting or knitting but you have no yarn at home? Do you have some old t-shirts laying around at home? If your answer is twice yes, than your problem is solved and you can start in no time ;-). Of course you can buy recycled T-shirt yarn in the shop, it has the same thickness as the one you will cut but it will have a different sentimental value. Nowadays we do think more in terms of recycling, well this is an excellent way to start. When searching on the net you will find more ways of 'how to cut your T-shirt into yarn', but for me this video explains it very well. If you will try this at home, please do use an iron board, like she explains, as this will make the job so much easier. The only part of the t-shirt used is the part just underneath the arms till just above the bottom seem of your t-shirt. Also make sure you won't cut the strips/yarn smaller than 1cm as you will need to pull the yarn slightly to make sure it rolls up and turns into real looking yarn ready to be crocheted or knit. If it is too thin you will pull it apart very easily. 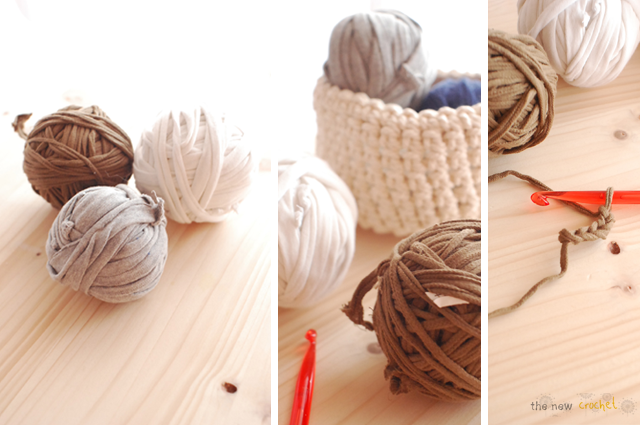 The yarn recuperated from one T-shirt is around 50gr. This yarn is excellent for potholders or for home made carpets. But you can also make a simple Christmas decoration with it which you can see in following blogpost. That video is great! Such a good idea to use the ironing board. And t-shirts are very cheap in charity shops! Thanks for the inspiration. Hi Ann, the first time you cut a t-shirt it might not have the same thickness everywhere but you will improve from the 2nd one. :-) It is a great way not to throw them out. Most of the time you buy a t-shirt because you like the colour so like this you can enjoy it a bit longer than expected. i like this post t Shirts is awesome i realy like this thanks for share nice blog.